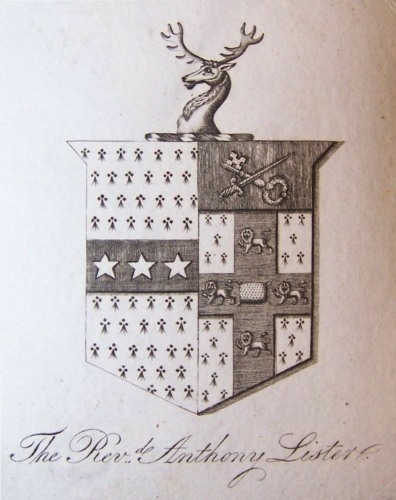 Vendor supermanifest is offering for sale on eBay the rather splendid bookplate of The Hon. 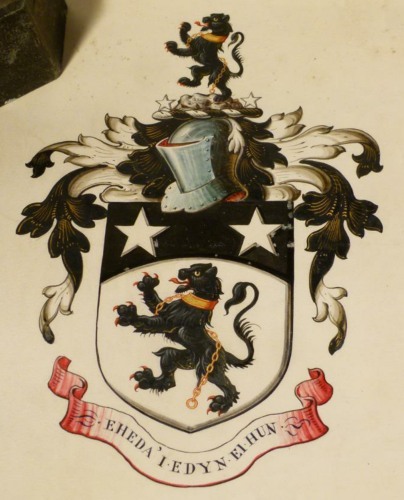 Robert Henry Meade. 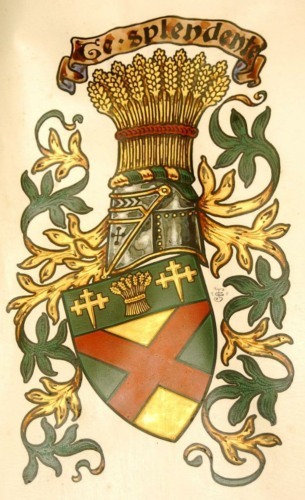 Robert was the second son of the 3rd Earl of Clanwilliam. 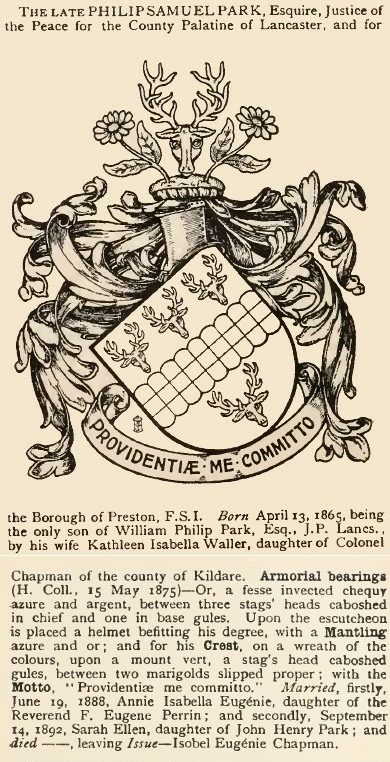 Sable a cross patonce within a bordure Or (for Lascelles). 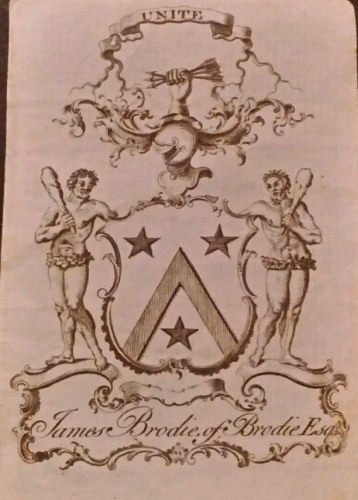 Crest: An eagle displayed with two heads Sable. 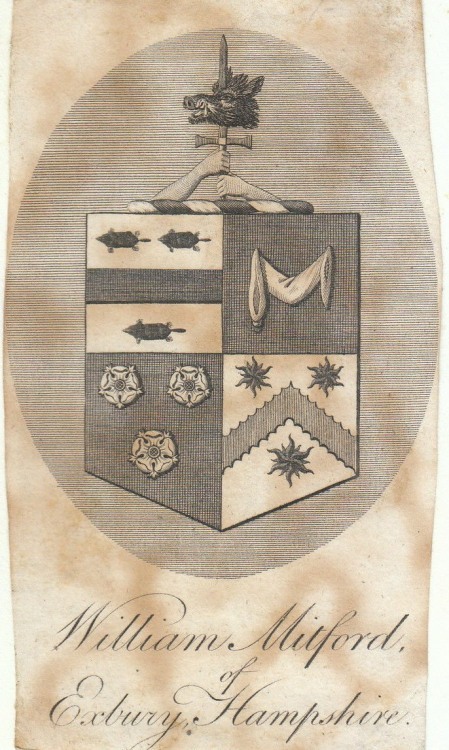 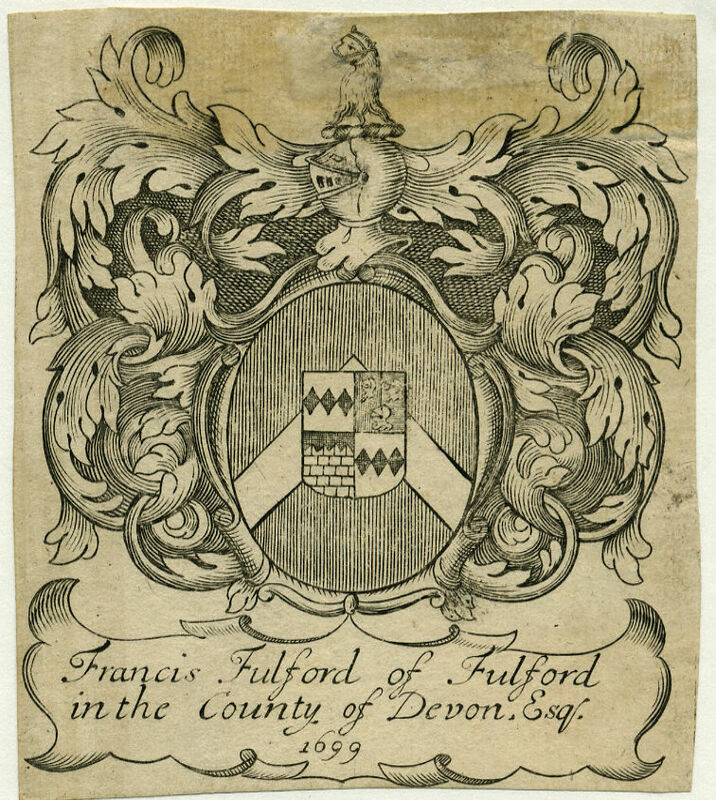 The bookplate is dated 1879 and the impaled Arms are those of his first wife,Lady Mary Elizabeth Lascelles, who died in 1866. 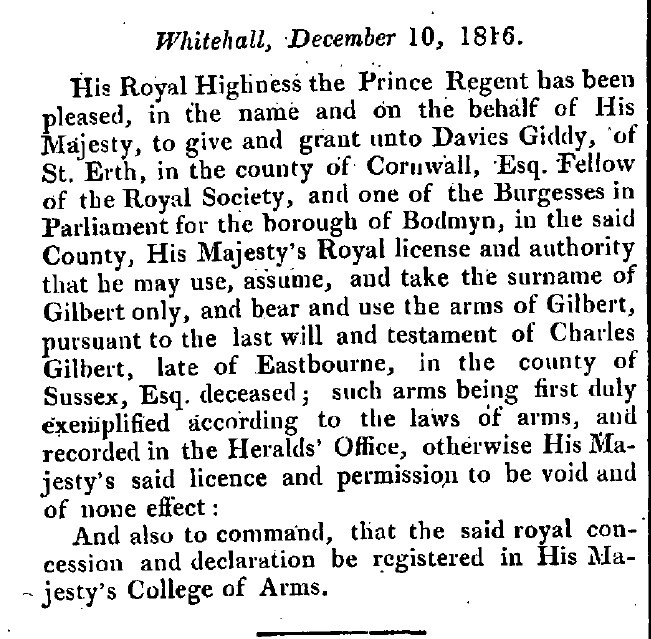 Robert remarried in 1880. 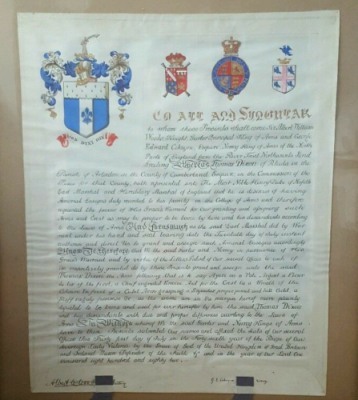 The 2nd & 3rd quarters have been displayed as grandquarters by other members of the family. 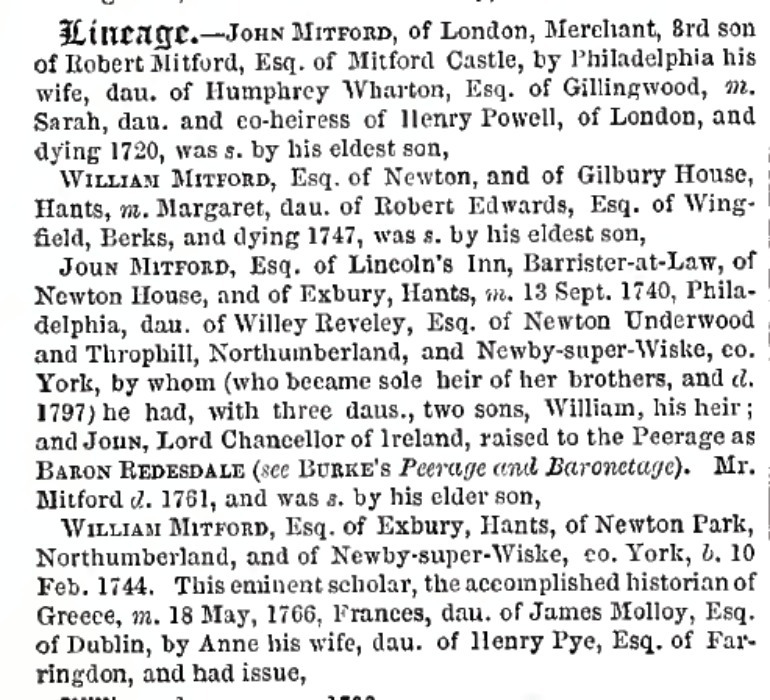 They are from the 1st Earls wife, Theodosia, the only child and heir of Robert Hawkins Magill. 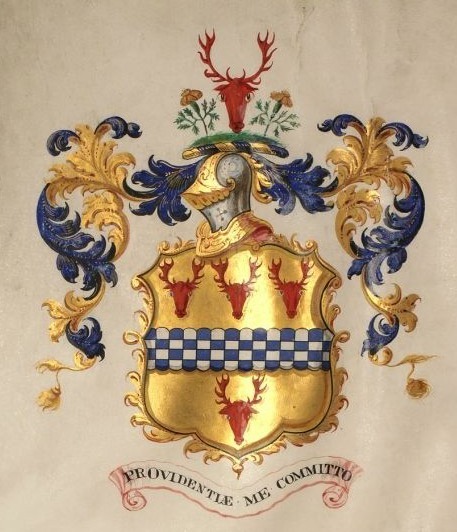 Burke’s General Armory lists the Arms for the Magill quarter as “Azure three peewits Argent“. 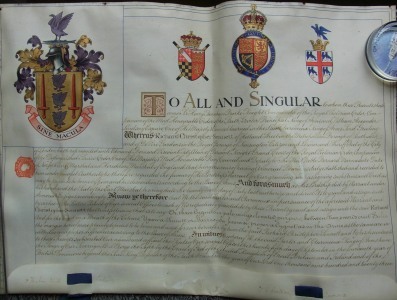 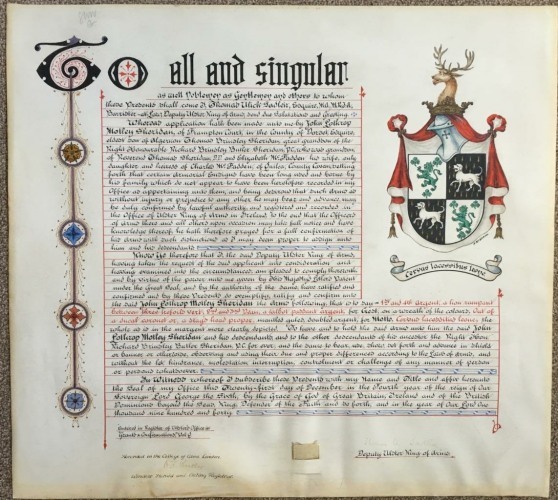 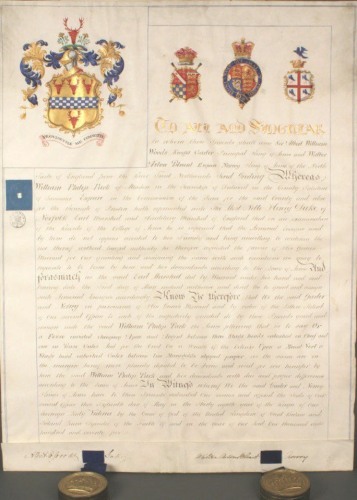 The 1900 Grant of Arms to George Alexander Stephen (1815-1908) in Australia is on sale on eBay (vendor stuartw6956). 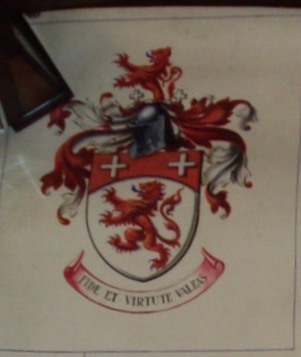 It is currently listed for £499.99. 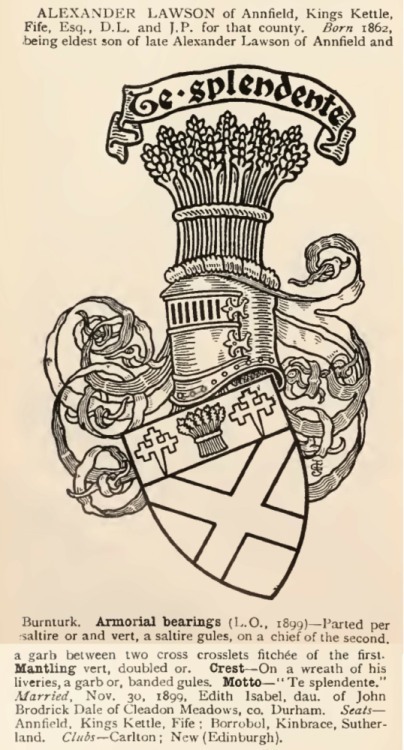 Arms: Argent on a chevron invected between two crescents in chief and an escallop in base Gules a sinister hand couped at the wrist between two mullets Or. 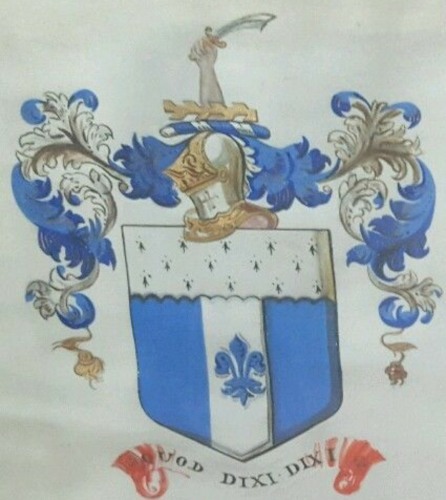 Crest: An eagle displayed with two heads Sable between on the dexter a decrescent and on the sinister an increscent holding in either beak an estoile all Or. 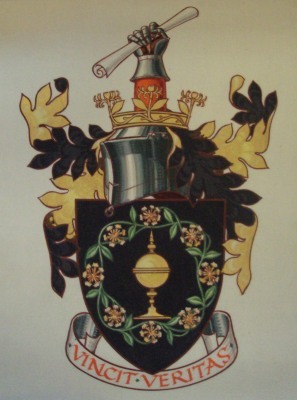 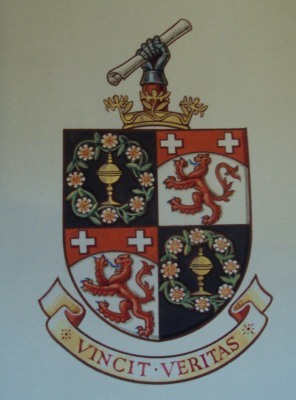 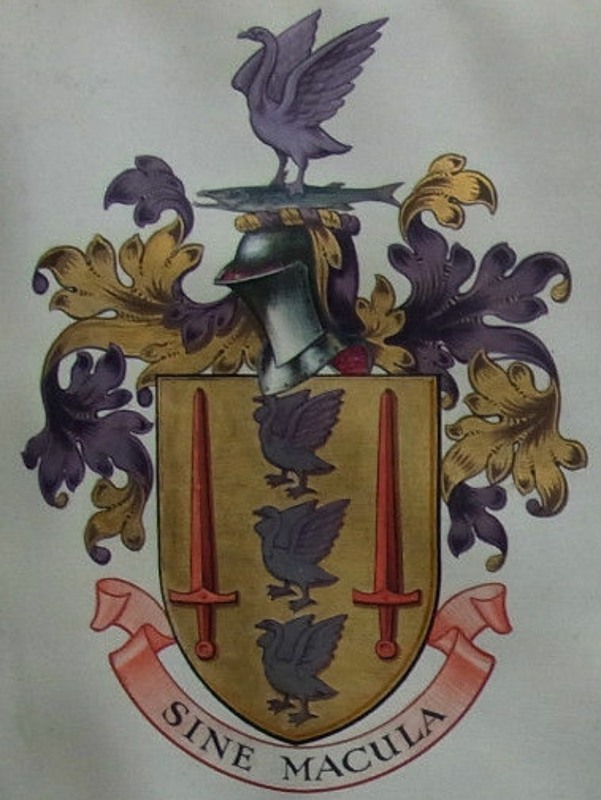 The Arms are a variation of those granted to Sir James Fitzjames Stephen Bart in 1891. 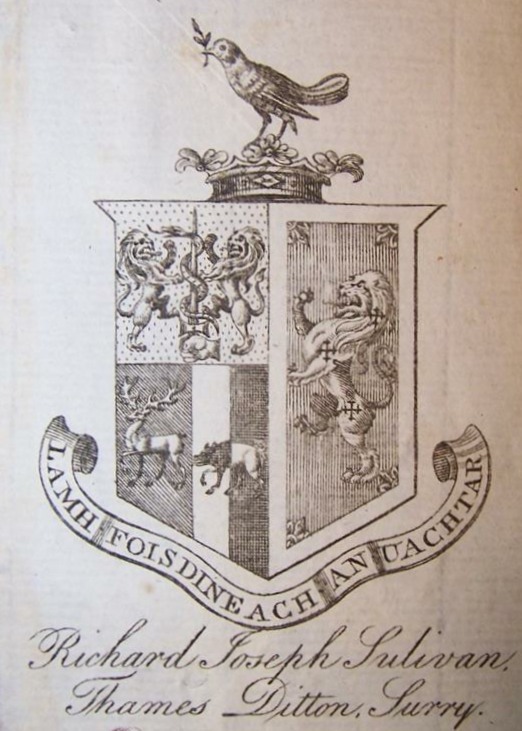 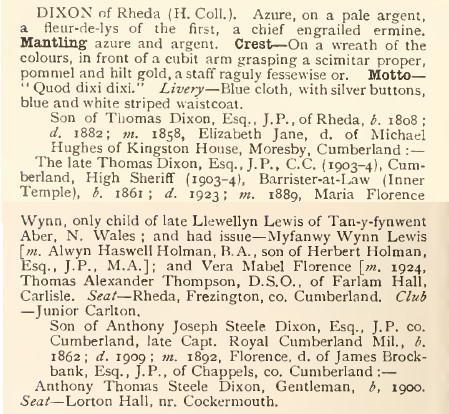 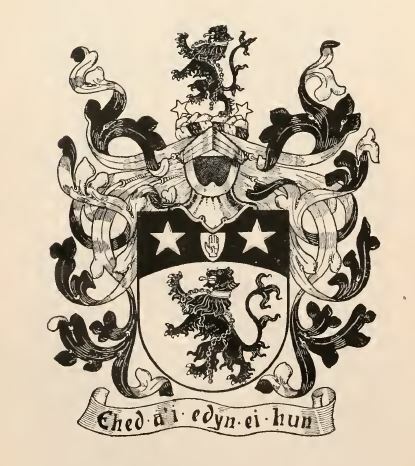 Both are described in Fox -Davies’ Armorial Families as “descending from Ardendraught, Aberdeenshire”. 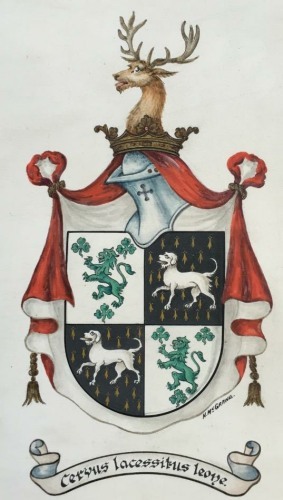 Arms: Argent on a chevron between two crescents in chief and a sinister hand couped at the wrist in base Gules an escallop between two mullets of the first. 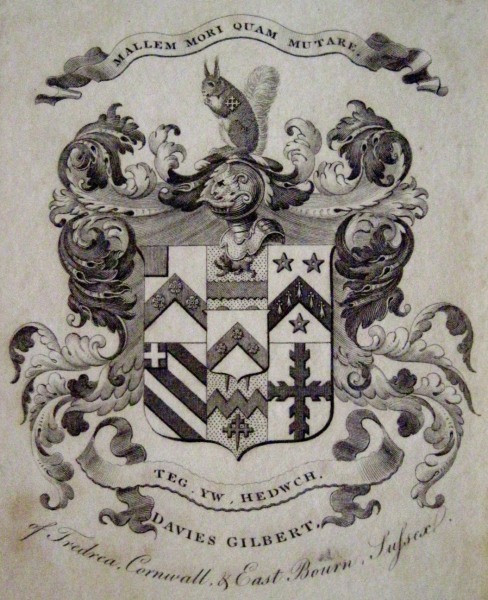 Crest: An eagle displayed with two heads Sable resting the dexter claw on an increscent and the sinister on a decrescent both Or.